The Sun King, Louis XIV of France, was a man that was used to getting what he wanted, and he wanted the most beautiful, buxom blonde in the land, Athénaïs. Never mind that Athénaïs was very much wanted by her own husband, Louis-Henri. Poor Louis-Henri, he was desperately in love and doomed for failure (It's not easy going up against a man called, 'The Sun King' you know). The Marquis de Montespan and his new wife, Athénaïs, are a true love-match- a rarity amongst the nobility of seventeenth-century France. But love is not enough to maintain their hedonistic lifestyle, and the couple soon face huge debts. When Madame de Montespan is offered the chance to become lady-in-waiting to the Queen at Versailles, she seizes this opportunity to turn their fortunes round. Too late, Montespan discovers that his ravishing wife has caught the eye of King Louis XIV. As everyone congratulates him on his new status of cuckold by royal appointment, the Marquis is broken-hearted. He vows to wreak revenge on the monarch and win back his adored Marquise. 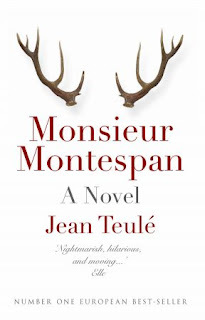 The author, Jean Teulé has captured the essence of the period brilliantly in this historical novel full of all the things I like best about the genre; real figures, real events, eloquent pose, and descriptive imagery, all with a dash of 17th century naughtiness. 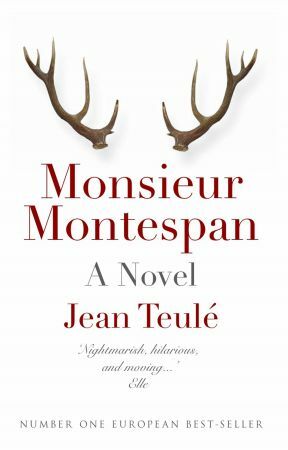 And since I would like you too to have a chance to spend evenings curled up with a glass of wine and a bawdy, naughty, romp, I'm giving away three copies of Monsieur Montespan for your reading pleasure. And I'm giving you three opportunities to win one of the three copies: 1st entry: What's your favorite book genre? Leave a comment telling me. 2nd entry: Be a follower and let me know by leaving a comment. 3rd entry: Like me on Facebook and leave a comment to let me know that you like me (I want you to like me). 1 comment for one entry. 2 comments for two entries. 3 comments for three comments. I enjoy history, factual or fictional.I am a follower and did the FB thing. Can I get a fourth entry for disliking NGZs? I am in LOVE with historical fact. LOVE! And I am a follower, but I too do not have a FB account. Okay, I have a fake FB account so I can follow some swanky stores in my area, but otherwise do not do the book of the face. Am I still in? My favorite book genre is science fiction! I enjoy Canadian fiction, not beacuse it is better than other countries, but there is only so much time to read and I like to support my Canadian authors. I'm a romantic, a real softie - anything that gives me a warm squishy feeling as I read it! I also like to learn something every now and then! I also 'LIKE' you on FB! and Follow you here and for a bonus point link to you from the Links page on my site! Seriously though, now that I have my Kindle, I love all books! Not a huge Sci-Fi fan but I have read a couple that aren't too bad. i like fiction. and weird science books that explain life. strangggge. but i love reading!! My favorite book genre? Historical romance, hands down. And oh, Louis!! What wonderful furniture you had! I'd give my eye's teeth for a roll-top secretaire from that era. Am really into the nonfiction travel books right now - comes in phases. Of COURSE I'm a stalker! Oops - I mean follower! Hmmm...favourite genre...that's a tough one. I think I like non-fiction the best. But I read just about anything that sounds interesting, really - From Harry Potter and Hunger Games to Memoirs of a Geisha and Eat, Pray, Love. I never knew you had a FB page, but I have totally liked it! Historical fiction tends to be my favorite. Though there are lots of non-fiction things I like, just depends on the subject. And of course I'm a follower and FB liker. How could I not be?! Okay, so this sounds like an amazing, amazing book! I really like historical fiction, and need to get more into it. I love fiction, but I don't know how to categorize my tastes more specifically. I also read way too many children's books, with my job and everything. Ahh, crossing my fingers on this one! Ah, historical fiction is always a fascinating afternoon. Monsieur Montespan sounds as if it will also need a glass of French wine (maybe, La Gramiere) in hand! i like historical fiction and factual books. I love historical books and biographies, as well as historical fiction. Anything I can get my hands on, I love history! 2.) I'm already a follower! 3.) I liked you on FB! 1. I'm a huge historical fiction reader. I just got done reading about Katherine, the first queen of Henry VIII. 3. You're officially liked on Facebook by me! 2) Of course, I follow the lovely Sara, Fifty, the husband and all the Honeys! 3) opps, didn't know you had a page. Will have to look for it. Already a follower. You know this. GIMME. Wheeee, a giveaway! I'll read just about any genre, as long as it's a good book. I Love fiction books, but then autobiography's too! so much to read so little time! I'm already a follower...so...beach reading is usually crime novels, and I love historical fiction...things like Pillars of the Earth. One of my favorite books of all time was, believe it or not, Clan of the Cave Bear. There! I'm entered! I love mysteries;). I'm a follower. And like you in fb too! Yehey! I am a follower!! I love to read anything about France or the French!! My favorite genre of books is historical fiction. I love getting lost in them! Hey! I like you on facebook! Hey! I like books! My favorite genre is dark humor and/or beatnik!